HAVE YOUR TEAM READ THE BOOK…THEN ACT WITH THE TRAINING! Now a series of on-site training and coaching sessions have been developed based on the core concepts of this highly anticipated transformational book on authentic leadership. This on-site training is customized for each organization to target current and future workplace challenges and aligned with organizational strategic initiatives and high priority goals. • Cultivating Trust, Respect, Open Communication and More! 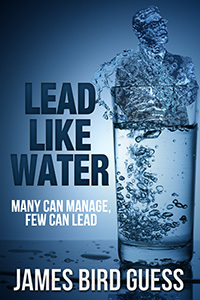 During the on-site training, teams will put into practice concepts outlined in James Bird Guess’ book, Lead Like Water, Many Can Manage, Few Can Lead. The on-site training includes high-energy exercises and activities, (no powerpoint is allowed), brief insightful lectures, and working sessions to allow time for practical application.